The District Department of Transportation (DDOT) and the Federal Highway Administration will hold a public hearing on Wednesday, June 29 from 6:30p to 8:30p at the Chevy Chase Community Center, 5601 Connecticut Avenue, NW to discuss the Environmental Assessment (EA) that rehabilitates a 1.7 mile section of Oregon Avenue NW. This hearing will help the project planners determine the optimal construction alternative that will make the road, which abuts Rock Creek Park, more accessible to pedestrians and bicyclists, among other goals. BAC and the DDOT Supervisory Transportation Planner, Jim Sebastian, are interested in public comments about the project. Also, those who live in the area or use the road, are encouraged to attend the hearing to provide suggestions or observations. This is the third public hearing for the project and is likely the final opportunity for public comment. The final decision document will be transmitted some time this summer with reconstruction of the road estimated to last 6 to 9 months. Oregon Avenue NW is a relatively narrow two-lane rural-like road that runs parallel to Rock Creek Park from Military Road NW to Western Avenue NW. While the Oregon Avenue trail parallels Oregon Avenue between Military Road and Wise Road, it is narrow in certain spots and does not extend the to Western Avenue. The current road conditions are somewhat difficult to navigate for pedestrians who would like to access Rock Creek Park and for bicyclists who would like to use the road. This is because there are no sidewalks, bike lanes or shoulders. Additionally, some vehicles use the road as an alternate to Beach drive, making travel on bikes challenging due to automobile traffic that occasionally travels above the posted speed limit and little or no space for car or bikes to pass. According to the EA, the alternatives development consisted of a three‐step collaborative process with the study team, stakeholders, and the public to develop a range of alternatives that incorporate elements to address each of the project’s needs that include roadway, storm water and drainage, and bicyclist and pedestrian elements as well as improving access to Rock Creek Park. 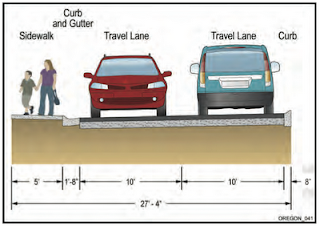 Alternative #2 - Rehabilitation of two 10‐foot travel lanes with curb and gutter and the installation of 5‐foot sidewalk on the west side of the road and a curb on the east. The total estimated construction cost for this option is $23.4 million. Alternative #3 - Oregon Avenue would be reconstructed similar to Alternative 2, with two 10‐foot travel lanes with curb and gutter and a 5‐foot sidewalk on the west side and a curb on the east. South of Nebraska Avenue to Military Road, where the existing right‐of‐way is 33 feet, Oregon Avenue would be reconstructed similar to Alternative 2, with two 10‐foot travel lanes with curb and gutter and a 5‐foot sidewalk on the west side and a curb on the east. North of Nebraska Avenue to Western Avenue, this alternative would transition to a cross‐section width of approximately 43 feet and would consist of two 10‐foot travel lanes with a 2‐foot shoulder, a 10‐foot grassy area and a 10‐foot shared‐use path on the west side. The total estimated construction cost for this option is $30.5 million. Alternative #4 - While the area south of Nebraska Avenue is similar to Alternative #3, north of Nebraska Avenue to Western Avenue would have a cross‐section width of 44 feet and include two 10‐foot travel lanes, a 4‐foot bike lane, 10‐ foot grassy area, and 5‐foot sidewalk on the west side, and a 4‐foot bike lane. Some of the sections of roadway will require retaining walls in order to stay within the right‐of‐ way and preserve the use of the adjacent homes’ front yards. These walls are estimated at 2 to 5 feet high in the Southern Section and up to 8 feet high in the Northern Section of the project. The total estimated construction cost for this option is $35.3 million. Of the three Candidate Build Alternatives, alternative #4, which includes bike lanes appears to be the option most advantageous for cyclists; however, BAC would like to hear your thoughts. Please feel free to leave comments on this page or send an email to jim.sebastian@dc.gov. Both oral and written statements will be taken at the Public Hearing. Comments may also be submitted to OregonEA@parsons.com or to Wayne Wilson, Project Manager at the District Department of Transportation, Infrastructure Project Management Administration 55 M Street, SE Washington, DC 20003. Comments will be accepted until July 14, 2011.